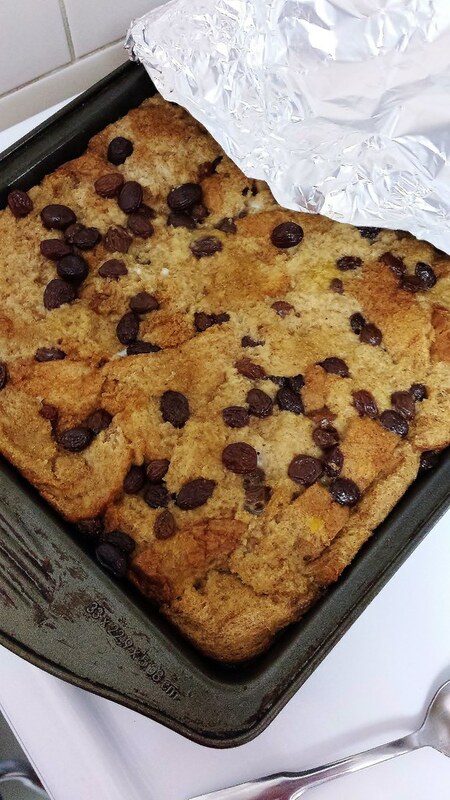 Belgian Style Bread Pudding (Dairy Free) | What Smells So Good? I woke up this morning to the dreary realization of two things. The first was that (yet again) it was Monday - where did the weekend go? (Answer: up in a Zumba-fied cloud of curry paste and gluten free pizza dough). The second was that Old Man Winter had once again blown through the neighbourhood and left his all-too-familiar, icy calling card. My car escaped the frost coat last night, thanks to my mom shuffling cars and allowing me to tuck it into the garage, but that didn't stop the morning from being a little on the brisk side! Luckily, being a Home Ec teacher has its perks - namely, that I can create "comfort food", warming menus for my lesson plans! My classes always run right after recess, so we're all chilled by then, and there's nothing better than getting into the warm embrace of the kitchen and making some belly-filling, bone-warming nosh! These days, I've been all about bread pudding - it's quite possibly the most stick-to-your-ribs, hearty, homey, soul food dessert I can think of in the Winter, and it is infinitely variable! I actually wound up doing a bit of research on the recipe for our "food around the world" week at school, and was surprised that I couldn't find much on it in British history. Instead, I discovered that the dish we know commonly as "bread pudding" originated in Belgium! Either way, it's definitely a great treat to make with the kids - they get to crack and beat eggs, sniff cinnamon and vanilla, tear up bread and smoosh it all into the pan! Everyone in my classes - from ages 3 to 9 - enjoyed the process and participated at their own level and interest rate. Due to allergies in some of my classes, I opted to make this version dairy free with flax milk. However, the richness of the dish doesn't suffer in the least (I credit that to the custard powder) and it is equally delicious hot, cold or reheated a few weeks later after being frozen! *Feel free to swap in 2% milk if allergies aren't an issue! Heat the oven to 350°F and grease a 9x13” baking dish or casserole. Tear the bread roughly into the pan and set aside. In a bowl, whisk together the eggs, custard powder, milk, butter, vanilla, sugar, cinnamon and nutmeg until well blended. Pour over the bread in the dish and stir gently to combine. Cover lightly with foil and bake for 45 to 50 minutes, until a knife inserted into the middle comes out clean.